Alexander III the Great, the King of Macedonia and conqueror of the Persian Empire is considered one of the greatest military geniuses of all times. He was inspiration for later conquerors such as Hannibal the Carthaginian, the Romans Pompey and Caesar, and Napoleon. 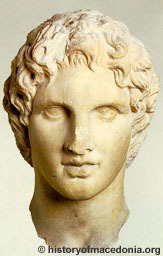 Alexander was born in 356 BC in Pella, the ancient capital of Macedonia. He was son of Philip II, King of Macedonia, and Olympias, the princess of neighboring Epirus. He spent his childhood watching his father transforming Macedonia into a great military power, winning victory after victory on the battlefields throughout the Balkans. When he was 13, Philip hired the Greek philosopher Aristotle to be Alexander’s personal tutor. During the next three years Aristotle gave Alexander a training in rhetoric and literature and stimulated his interest in science, medicine, and philosophy, all of which became of importance in Alexander’s later life. In 340, when Philip assembled a large Macedonian army and invaded Thrace, he left his 16 years old son with the power to rule Macedonia in his absence as regent, which shows that even at such young age Alexander was recognized as quite capable. But as the Macedonian army advanced deep into Thrace, the Thracian tribe of Maedi bordering north-eastern Macedonia rebelled and posed a danger to the country. Alexander assembled an army, led it against the rebels, and with swift action defeated the Maedi, captured their stronghold, and renamed it after himself to Alexandropolis. Two years later in 338 BC, Philip gave his son a commanding post among the senior generals as the Macedonian army invaded Greece. At the Battle of Chaeronea the Greeks were defeated and Alexander displayed his bravery by destroying the elite Greek force, the Theban Secret Band. Some ancient historians recorded that the Macedonians won the battle thanks to his bravery. With the conquered territories firmly in Macedonian control, Alexander completed the final preparations for the invasion of Asia. The 22 year-old king appointed Philip's experienced general Antipater as regent in his absence to preside over the affairs of Macedonia and Greece, left him a significant force of 13,500 Macedonian soldiers to watch Greece, Thrace, Illyria, and protect Macedonia, and set out for the Hellespont (modern Dardanelles) in the spring of 334 BC. 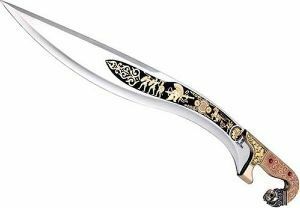 As his ship approached the Asia Minor's coast, he threw his spear from abroad and stuck it in the ground. He stepped onto the shore, pulled the weapon from the soil, and declared that the whole of Asia would be won by the Macedonian spear.In the army there were 25,000 Macedonians, 7,600 Greeks, and 7,000 Thracians and Illyrians, but the chief officers were all Macedonians, and Macedonians also commanded the foreign troops. Alexander's second in command was Philip's general Parmenio, the other important commanders being Perdiccas, Craterus, Coenus, Meleager, Antigonus, and Parmenio's son Philotas. The army soon encountered the forces of King Darius III. There were 40,000 Persians and Greeks (20,000 each) waiting for them at the crossing of the river Granicus, near the ancient city of Troy. These Greeks had joined the Persians in the years following the defeat of the Greek army by Philip II at Chaeronea. It is important to note the number of Greeks on the both sides. The Greeks in the Macedonian train were mobilized by the Macedonians, and historians Peter Green and Ulrich Wilcken speak of them as hostages that would ensure the good behavior of their countrymen left behind in Greece under the watch of Antipater's Macedonian garrisons. Not surprisingly, the Greeks in Alexander's army played insignificant role in the upcoming battles, only to be discharged when convenient. But far greater number of Greeks joined the Persians brushing away the memory of the Persian invasion of Greece some 150 years ago. The ancient Greek historian Arrian cited the "old racial rivalry between the Greeks and Macedonians" that led to this hatred on both sides. The Macedonians defeated the Persians and put them to flight and although the Greeks held their ground and fiercely fought, the battle ended in Macedonian victory. Almost the entire Greek force was annihilated. 18,000 Greeks perished on the banks of Granicus and the 2,000 survivors were sent to forced labor in Macedonia. The Macedonians lost only 120 men according to tradition. Alexander then led the army south across Asia Minor. Ironically, it is not the Persians but the Greek coastal cities which gave the greatest resistance to the Macedonians. The Greek commander Memnon and his men considerably slow down the advance of Alexander and many Macedonians died during the long and difficult sieges of the Greek cities of Halicarnassus, Miletus, Mylasa. But at the end the Macedonian army defeated the enemy and conquered the coast of Asia Minor. Alexander then turned northward to central Asia Minor, to the city of Gordium. Gordium was a home of the famous so-called Gordian Knot. Alexander knew the legend that said that the man who could untie the ancient knot was destined to rule the entire world. To that date nobody had succeeded in raveling the knot. But the young Macedonian king simply slashed it with his sword and unraveling its ends. Darius's army greatly outnumbered the Macedonians, but the Battle of Issus ended in a big victory for Alexander. Ten's of thousands of Persians, Greeks, and other Asiatic soldiers were killed and king Darius fled in panic before the Macedonian phalanx, abandoning his mother, wife, and children behind. Alexander treated them with the respect out of consideration for their royalty.